The Flemington Opa! 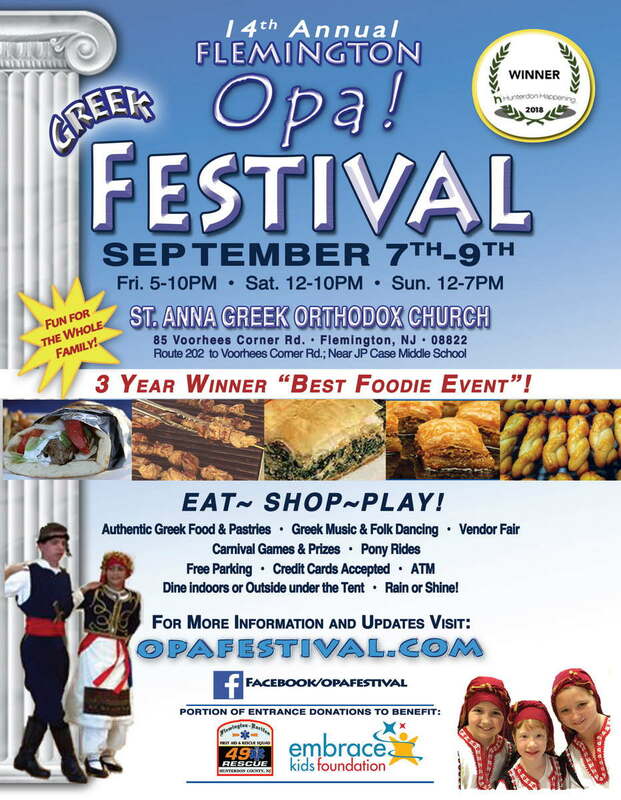 Greek Festival is west Central Jersey’s biggest cultural family event, featuring food, shopping, fun, and entertainment. The festival has been voted as the “Best Foodie Event” in Hunterdon county for the past three years by Hunterdon Happening, with an extensive menu of delicious Greek fare such as classic oven baked items and popular grill selections such as souvlaki and gyros. The festival also has a Taverna with Greek and domestic wine and beer as well as a cafe featuring Greek pastries and coffee. In addition to the food, there will be carnival games & prizes for the family to enjoy, pony rides, face painting, as well as Greek folk dancing and Greek Music. The International Marketplace Vendor Fair will feature an array of merchants to satisfy a wide variety of shopping interests. Admission is $2 for those 12 and older with a portion of entrance donations supporting the Flemington-Raritan First Aid & Rescue Squad, and Embrace Kids Foundation. Parking is free on-site and at JP Case Middle School with free shuttle service. The event will be held rain or shine. Visit the website and Facebook page for a complete schedule of entertainment and activities. Vendor information can be found at the Flemington Opa! Festival’s vendor page.